I don’t think lager was ever considered lucky – certainly not after 11 cans of the strong stuff, a late-night large meat n’ chips, and the last bus home missed. 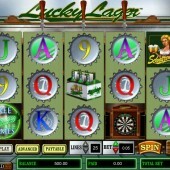 But some heavy drinking could be your route straight to slots riches with slot developer Cryptologic’s bar-themed online video slot, Lucky Lager. Populating a weird mix of English pub and German bierkeller, Lucky Lager features as its main icons 10-through-Ace symbols, a buxom bar wench clutching steins of frothy beer, some beer kegs, and a dartboard. Betting on the 25 paylines starts at just $0.01 a coin, but $10 coin bets are available for the big-spending gamblers. Get On It! Drinking Beer is Wiiild! The glass of beer in this mash-up of Northern European drinking dens acts as a Wild and it expands, turning all symbols appearing above it into wilds. It substitutes for all regular symbols in the game – in that crazy way that only Wilds seem to do – except for the Scatters. Three Dartboards scattered on Reels 2, 4 and 5 triggers the first bonus round as you take a step up to the oche to try your arm at getting nearest the bull. ‘Pick’ three darts to send skywards towards the dartboard and win cash and multipliers for every decent hit you land. Three Free Games logos on Reels 1, 3 and 5, meanwhile, will bag you 10 free spins, and although there’s no multiplier to go along with the spins, one reel will randomly turn Wild for each spin. 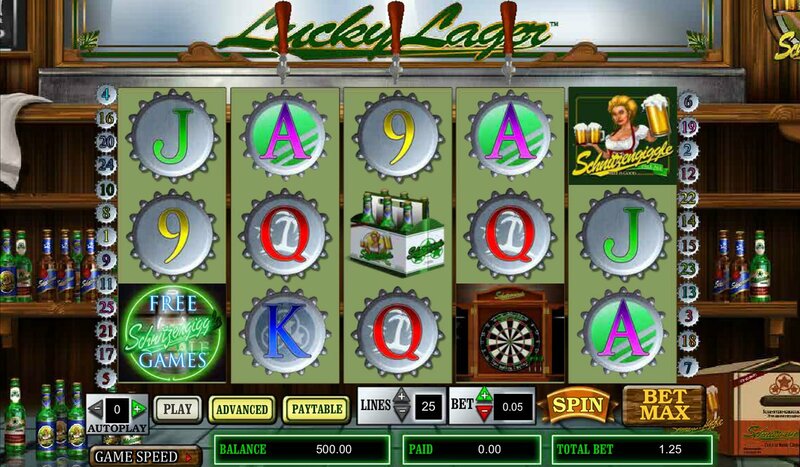 If you like how Lucky Lager goes down, hunt out some similar slosh – sorry, slots – online. Microgaming’s Oktoberfest-themed game, Beer Fest, treads similar ground to Cryptologic’s excellent Pints and Pounds, while Steinfest – also from Microgaming - with its Bavarian beer-drenched atmosphere (and fantastic ‘Beer Chug Bonus’ round) is worth an hour or two of anyone’s time. There is also Cryptologic's very own Oktoberfest slot that also successfully delves into the combination of slots gaming and beer drinking.